The Roland V-60HD Multi-Format HD Video Switcher is a true multi-format video switcher, meaning it doesn't require input sources to be matched to output resolutions. Suitable for a variety of live events, including but not limited to corporate, education, house of worship, and theater. The V-60HD enables live switching of HD and computer video formats without requiring external scan converters. 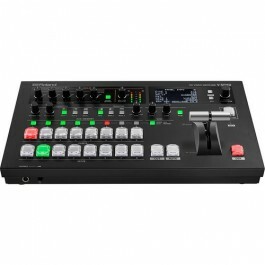 It supports up to eight inputs with four SDI, two HDMI, plus two still image files. The HDMI inputs support video and computer resolutions, allowing you mix video and computer graphic formats. Two SDI and two HDMI-assignable outputs support program, preview, and auxiliary busses, allowing you to easily send discreet outputs to separate displays. The HDMI multiview output enables viewing your eight inputs, as well as program and preview, on a single monitor with audio level display.